This morning, some fifty people gathered outside Trump Tower’s fifth-floor public terrace to protest proposals from New York Governor Cuomo and President Trump that would affect affordable and public housing in New York. The event was organized by Alliance for Tenant Power and Real Rent Reform, two grassroots coalition groups that draw support from a range of New York City tenant organizations, labor unions, not-for-profits, and advocacy groups. The teach-in started at 11:30 a.m. as protestors arrived just outside the terrace entrance, located on the top floor of the Tower’s large central atrium. Prior to the election, Trump Tower’s two tucked-away public terraces seemed to exemplify the slight-of-hand developers can use to leverage extra development rights without meaningfully giving back to the public. Recently, they’ve become a venue for protestors to gather at the heart of President Trump’s most prominent development. 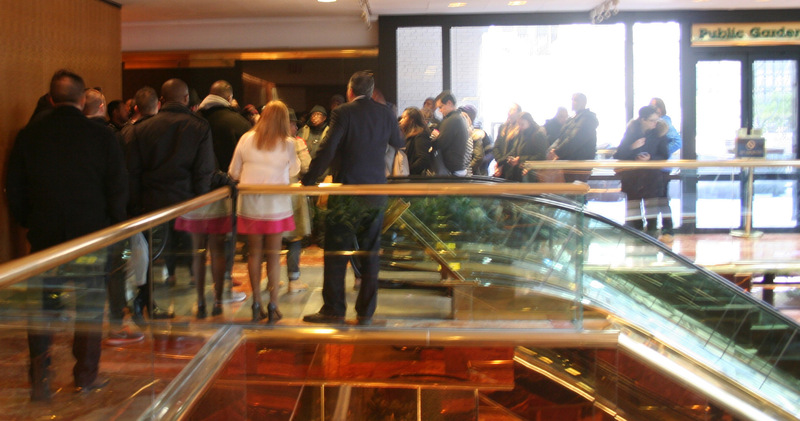 Civil rights attorney Samuel B. Cohen was on hand to speak to Trump Tower staff and inquire about the space’s closure. Just like a sidewalk or any other public space, he told the crowd, Trump Tower has an obligation to clear the space for public use. Regardless, the teach-in continued, as the NYPD did not express safety concerns about the crowd. Over the course of approximately 45 minutes, protestors spoke out against Governor Cuomo’s proposed renewal of the 421-a tax break, which is designed to spur the development of multi-unit buildings on vacant land. Tom Waters, housing policy analyst from the Community Service Society, said 421-a was a product of the 1970s, an era when the city was in dire straits. “Those times are over,” he said, adding that 421-a would create far more value for developers than for the public. Waters also spoke out against a new provision in the bill that extends 100 percent tax-exempt status for certain new affordable developments from 25 to 35 years, a move which could generate further profits for developers. Waters also explained that Trump Tower itself was a product of 421-a tax exemptions when it was built; according to The New York Times the project received “an extraordinary 40-year tax break that has cost New York City $360 million to date in forgiven, or uncollected, taxes, with four years still to run, on a property that cost only $120 million to build in 1980.” After being initially denied 421-a exemptions for Trump Tower, Trump successfully sued the city, and he later won 421-a exemptions for his Trump World Tower under the Guiliani and Bloomberg administrations in a similar fashion.